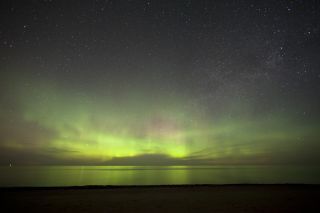 Skywatcher Shawn Malone took this photo of the aurora March 15-16, 2012. She writes: "[A]urora activity picking up casts a bright reflection off of Lake Superior, Marquette, MI." The northern lights, or aurora borealis, offer an entrancing, dramatic, magical display that fascinates all who see it — but just what causes this dazzling natural phenomenon? At the center of our solar system lies the sun, the yellow star that sustains life on our planet. The sun's many magnetic fields distort and twist as our parent star rotates on its axis. When these fields become knotted together, they burst and create so-called sunspots. Usually, these sunspots occur in pairs; the largest can be several times the size of Earth's diameter. Auroras occur not only on Earth, but also on other worlds in our solar system (and perhaps exoplanets as well). The gas giants in our solar system (Jupiter, Saturn, Uranus and Neptune) each have thick atmospheres and strong magnetic fields, and each have auroras — although these auroras are a little different from Earth's, given they are formed under different conditions. Venus has an aurora generated by its stretched-out magnetic field (a "magnetotail"). Mars, which has too thin an atmosphere for global auroras, experiences local auroras due to magnetic fields in the crust. NASA's MAVEN (Mars Atmosphere and Volatile Evolution) spacecraft also found widespread northern hemisphere auroras generated by energetic particles striking the Martian atmosphere. "This solar cycle continues to rank among the weakest on record," Ron Turner of Analytic Services, Inc. who serves as a Senior Science Advisor to NASA's Innovative Advanced Concepts program, said in a statement. Since record-keeping of the ebb and flow of the sun's activity began in 1749, there have been 22 full cycles. Researchers monitor space weather events because they have the potential to affect spacecraft in orbit, knock out power grids and communications infrastructure on Earth, and amp up normal displays of the northern and southern lights. Scientists are also investigating how fluctuations in the sun's activity affect weather on our planet. Earth is constantly bombarded with debris, radiation and other magnetic waves from space that could threaten the future of life as we know it. Most of the time, the planet's own magnetic field does an excellent job of deflecting these potentially harmful rays and particles, including those from the sun. Particles discharged from the sun travel 93 million miles (around 150 million km) toward Earth before they are drawn irresistibly toward the magnetic north and south poles. As the particles pass through the Earth's magnetic shield, they mingle with atoms and molecules of oxygen, nitrogen and other elements that result in the dazzling display of lights in the sky. An Expedition 30 crew member took this photo of the North Atlantic with an aurora on March 28, 2012. The auroras in Earth's Northern Hemisphere are called the aurora borealis. Their southern counterpart, which light up the Antarctic skies in the Southern Hemisphere, are known as the aurora australis. The colors most often associated with the aurora borealis are pink, green, yellow, blue, violet, and occasionally orange and white. Typically, when the particles collide with oxygen, yellow and green are produced. Interactions with nitrogen produce red, violet, and occasionally blue colors. The type of collision also makes a difference to the colors that appear in the sky: atomic nitrogen causes blue displays, while molecular nitrogen results in purple. The colors are also affected by altitude. The green lights typically in areas appear up to 150 miles (241 km) high, red above 150 miles; blue usually appears at up to 60 miles (96.5 km); and purple and violet above 60 miles. These lights may manifest as a static band of light, or, when the solar flares are particularly strong, as a dancing curtain of ever-changing color. For millennia, the lights have been the source of speculation, superstition and awe. Cave paintings in France thought to date back 30,000 years have illustrations of the natural phenomenon. In more superstitious times, the northern lights were thought to be a harbinger of war or destruction, before people really understood what causes them. Many classic philosophers, authors and astronomers, including Aristotle, Descartes, Goethe and Halley, refer to the northern lights in their work. As early as 1616, the astronomer Galileo Galilei used the name aurora borealis to describe them, taking the name of the mythical Roman goddess of the dawn, Aurora, and the Greek name for wind of the north, Boreas. The aurora australis, or the southern lights, occur around the south polar region. But, since the South Pole is even more inhospitable than the North Pole, it is often trickier to view the southern lights. Astrophotographer Antti Pietikäinen took this aurora photo on Jan. 24, 2012 in Muonio, Lapland, Finland. On rare occasions, the lights are seen farther south. They were first observed by European settlers in New England in 1791. In "Historical Storms of New England," published in 1891, Sidney Perley wrote, "May 15, 1719, the more beautiful and brilliant aurora borealis was first observed here as far as any record or tradition of that period inform us, and it is said that in England it was first noticed only three years before this date. In December of the same year the aurora again appeared, and the people became greatly alarmed, not dreading it so much as a means of destruction but as precursor of the fires of the last great day and a sign of coming dangers." The northern lights are always present, but winter is usually the best time to see them, due to lower levels of light pollution and the clear, crisp air. September, October, March and April are some of the best months to view the aurora borealis. The lights are known to be brighter and more active for up to two days after sunspot activity is at its highest. Several agencies, such as NASA and the National Oceanic and Atmospheric Administration, also monitor solar activity and issue aurora alerts when they are expected to put on a particularly impressive show.